serving a county jail sentence under Realignment (AB 109). currently found mentally incompetent to vote by a court. *If you are not sure of your custody status or what type of sentence you are serving, please check with your parole or probation officer or complete and submit an Inmate Message slip requesting the information. In California, you always keep your right to vote unless you are currently serving a state or federal prison sentence or currently on parole. How Do I Register From Jail? The facility administrator of a Type I (holding sentenced inmate workers) II, III or IV facility shall develop written policies and procedures whereby the county registrar of voters allows qualified voters to vote in local, state, and federal elections, pursuant to election codes. Inmates who would like to participate in local, state and federal elections should contact the Orange County Registrar of Voters for information and materials. You must register to vote at least 15 days before Election Day. Refer to the enclosed Request-for-Materials Letter addressed to the Orange County Registrar of Voters and fill in the blanks. Mail the completed letter to the Orange County Registrar of Voters. Enclosed is a pre-addressed envelope. The Orange County Registrar of Voters will provide voting materials to you. Fill out your Voter Registration Card and Vote-by-Mail Ballot Application when you receive them. Include your booking number on each and return them to the appropriate address. When you receive your ballot, mark your choices and return to the appropriate address. You can find out if your vote-by-mail ballot arrived at the county elections office, if your ballot was counted, and, if not, the reason why it was not counted by calling 714-567-7600. How Do I Register If I'm No Longer In Custody? You can pick up a paper registration form at the DMV, post office, public library, or your county elections office. Complete the form, sign it, and drop it in the mail. You can call 800-345-VOTE (8683) and ask for a registration form to be mailed to you. Federal law requires that the Orange County Registrar of Voters provide translated election materials and bilingual support in English, Spanish, Chinese, Korean and Vietnamese. If you wish to receive your voting materials in a language in addition to English, please detail so on your Request-for-Materials Letter and Voter Registration Card. If you are not a resident of Orange County, you can still send the Request-for-Materials Letter to the OC Registrar of Voters. The OC Registrar of Voters will ensure that the request is sent to the appropriate county elections office. ELECTION DAY is TUESDAY, JUNE 5, 2018. 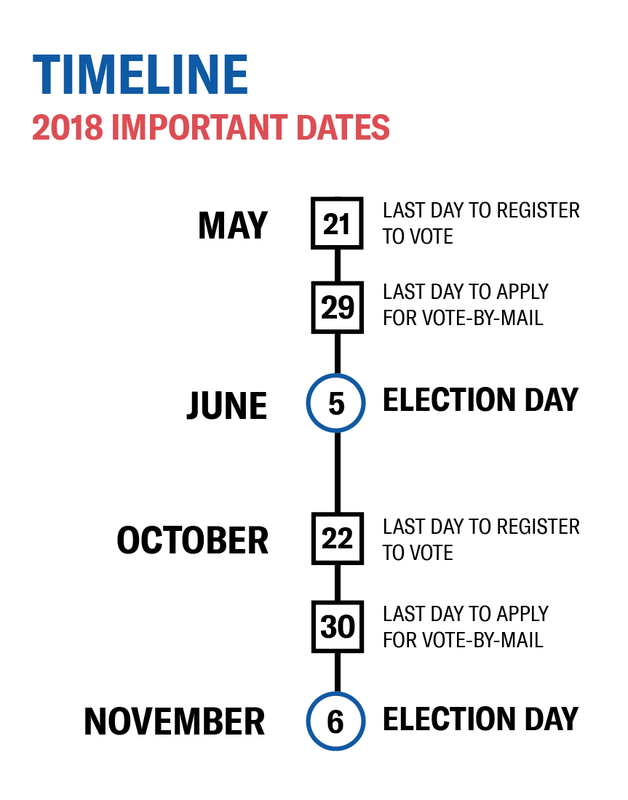 Last day to register to vote is Monday, May 21, 2018. Last day to apply for a vote-by-mail ballot is Tuesday, May 29, 2018. This election includes the following contests: Sheriff, District Attorney, County Supervisors, and several others. If you register to vote you will receive additional materials about the races and candidates. Last day to register to vote is Monday, October 22, 2018. Last day to apply for a vote-by-mail ballot is Tuesday, October 30, 2018. This election includes the following contests: governor, state senator, ballot initiatives and several others. If you register to vote you will receive additional materials about the races and candidates. Contact the California Secretary of State Investigative Services. Contact the ACLU SoCal Jails Project.